2019 IP Video Contest Opens 1 March! CREATE A 30-60 SECOND VIDEO about how intellectual property fuels your passions. Most Facebook Likes Category – All finalists qualify for a $1,500 cash prize for the most likes on Facebook! • Videos must be no more than 60 seconds in length. • Cover up any brand names and/or logos on clothing, background items, props, etc., or use plain, non-brand items. 1. A screening committee will process submissions. 2. Finalist videos will be added to the IPO Education Foundation Facebook page by 13 May 2019. 3. Share the videos with your family, friends, and colleagues! 4. The IPO Education Foundation Board of Directors and your vote on Facebook will determine the winners. 5. Winners will be announced the first week of June 2019. To enter, access the contest website during the official contest period, complete the official entry form and submit it along with the video, Talent Release form(s) and Assignment of Copyright form as directed. Entries must be submitted no later than 11:59 PM Eastern Time on 30 April 2019. Limit of one entry per person. Entries become the property of IPO Education Foundation and will be neither acknowledged nor returned. 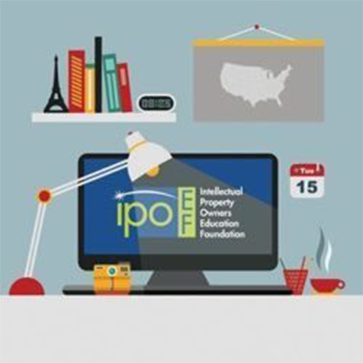 The Intellectual Property Owners (IPO) Education Foundation IP Video Contest is open to individuals who reside in the fifty United States, including the District of Columbia. Qualified individuals will select finalists in each category, which will then be posted on the contest website, the contest YouTube profile, and the IPO Foundation’s Facebook fan page. Voting will be open to the public in May 2019 and will remain open for two weeks to determine a winner in each category. There will be a limit of one vote per person. Voting is done by the public and members of the IPO Education Foundation Board of Directors. In the event of a tie in the online voting, the tied videos will be judged by qualified individuals. Winners will be individually notified by email no later than 3 June 2019. The IPO Foundation will publicly announce the winners of the contest no later than 31 June 2019. The two winners in the 16+ age group will receive their choice of either a $5,000 cash prize or scholarship. Winners who select to receive a scholarship as their prize will receive it in the form of a check to an accredited college (public, private, junior college, or community college), university, or trade school at which the winner is enrolled. Should the winner not yet be enrolled in any school at the time of prize notification, the scholarship will be available for up to two years from date of the prize notification and if not used after such time, the award will be forfeited. Scholarship payment will be applied to tuition and any remaining balance can be used for other valid school charges. In the event a winner leaves a school and is entitled to a cash refund for all or any part of the scholarship payment, at sole discretion of IPO Education Foundation, refund payment shall be made to IPO Education Foundation or to an eligible school to which the winner has transferred. The winner in the Enter for Charity category must be atleast 13 years of age and will receive a cash prize in a check payable to a 501(c)3 charitable nonprofit organization. In addition to the cash prizes and scholarships, IPO Education Foundation reserves the right at its sole discretion to award each of the winners with a trip for two to the IPO Foundation Awards Dinner in Washington, DC on 12 December 2019. The trip consists of round-trip coach airfare from the major airport nearest each winner’s residence, two-night hotel accommodations (double room), ground transportation, meals and other expenses. Winners may also be required to participate in the IPO Foundation Awards Dinner, where their videos could be shown. If a winner is under the legal age of eighteen, their travel guest must be their parent or legal guardian. All parents or legal guardians accompanying a minor must complete and sign a Liability Release prior to issuance of travel documents. Winners of the legal age of eighteen traveling with a companion under the age of eighteen must provide a Liability Release for their accompanying minor. The Liability Release must be ratified and signed by accompanying minor’s parent or legal guardian. Should the aforementioned trips not be awarded, winners shall not be entitled to any cash or other compensation in lieu thereof. Prizes may not be transferred. No cash or other substitution may be given for a prize, except IPO Education Foundation reserves the right in its sole discretion to make a substitution, in whole or in part, for a prize of comparable or greater value. Winners are responsible for paying taxes on a prize, including cash prizes, and any expenses not specified relating to the acceptance and use of a prize. An IRS Form 1099 will be issued to winners where applicable. Determination as to whether a school is properly accredited and/or a winner is properly enrolled in a school shall be made by IPO Education Foundation in its sole discretion and winners will be responsible for promptly providing any documentation relating thereto as requested by IPO Education Foundation. IPO Education Foundation reserves the right to contact the winner’s school directly. Winners and guests receiving a trip to Washington, DC, must travel on the same itinerary and on dates and times approved by IPO Education Foundation. Winners will be notified by a traceable form of delivery and e-mail or telephone. Each winner will be required to provide within a specified time period a photocopy of a valid photo ID (driver’s license, passport, or other form of identification and proof of age); evidence satisfactory to IPO Education Foundation of enrollment as a student; a completed and signed Affidavit of Eligibility and Liability Release and a Publicity Release; an assignment to IPO Education Foundation of all rights of ownership and copyright to the submitted video; and a consent for IPO Education Foundation to use the video, in whole or in part and as edited by IPO Education Foundation, in all media for educational, commercial and other uses without additional compensation to or prior review by the winner. In addition, a separate Talent Release Form (downloaded from the IP Video Contest website) signed by each individual appearing in the video will be required. Failure to return the required documents in a timely way, or the return of any notification as undeliverable for any reason, will cause the entry to be void and an alternate winner to be selected. If a winner (or any individual appearing in a video) is under the age of eighteen, all relevant documents must be confirmed, ratified and signed by the parent or legal guardian of the individual signing the document(s). By participating, entrants (and if under eighteen years old, the entrant’s parent or legal guardian): (a) agree to these official rules and to the decisions of the judges and IPO Education Foundation and its agents in all matters, including the voting process, relating to the contest, which decisions shall be final in all respects; (b) release, indemnify and hold harmless IPO Education Foundation, its parent organization, Intellectual Property Owners Association and their respective directors, officers and employees, from any and all claims, liabilities, losses or damages of any kind whatsoever, including but not limited to the infringement of intellectual property rights of others, resulting in whole or in part from their participation in the contest and the acceptance and use of the prize; (c) consent to the use of their name, likeness and location for advertising and publicity purposes by IPO Education Foundation, in its sole discretion, of its products and services and for promotion of the importance of protection of intellectual property rights; and (d) represent that the video submitted is their sole and original work and does not infringe the intellectual property rights of any other party. Participants agree that IPO Education Foundation and its agents are not responsible for late, lost or misdirected entries or mail, or for error, omission, interruption, deletion, defect, delay in transmission, theft or destruction or unauthorized access to or alterations of entry materials, or for technical, network, computer, hardware or software malfunctions of any kind, or inaccurate transmission of or failure of IPO Education Foundation and its agents to receive entries for any reason whatsoever or for any errors, mishaps or problems, regardless of the cause, in the voting process. In the event IPO Education Foundation determines that the integrity of the contest has been impaired or corrupted for any reason and as a result cannot be offered or completed as planned, IPO Education Foundation reserves the right in its sole discretion to cancel or terminate the contest and to select winners from among eligible entries legitimately received prior to the event causing cancellation or termination; and notice of cancellation will be posted at www.ipoef.org. Should IPO Education Foundation and judges, in their sole discretion, determine that there are insufficient entries worthy of being selected as a finalist, they reserve the right to select less than the stated number of winners in any category; and in such event the dollar value of the finalist prizes not awarded shall be applied by IPO Education Foundation to education about the importance of intellectual property rights and the patent system. The contest shall be governed by and interpreted under the laws of the District of Columbia; and any legal action concerning the contest shall be brought only in a state or federal court located in Washington, District of Columbia. Dates are subject to change.